Here’s another entry under the category of good reading, a New York Times piece about a proposed 30-year plan for Chicago, including its public transit network. One noteworthy point to Des Moines: The plan treats Chicago not as a stand-alone city but a so-called megaregion, which among other things means a regional hub for passenger rail. 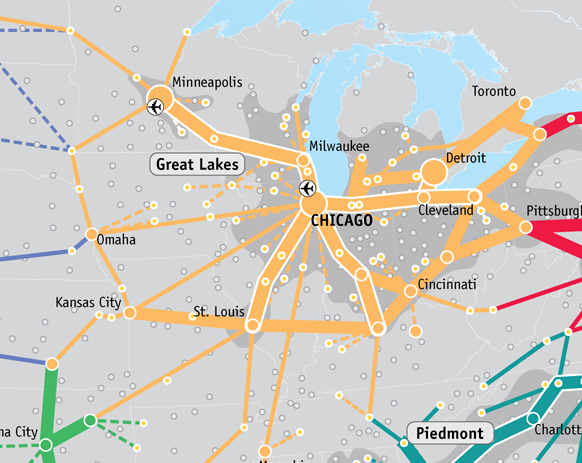 Check out this map, courtesy of Transportation for America, an advocacy group that calls the nation’s transportation network “half a century behind” and proposes a passenger rail network composed of 11 megaregions. Click here for the full map. This entry was posted in Good reading, passenger rail by DART. Bookmark the permalink.